If you read my post on creating a capsule wardrobe, you may have noticed that I included a pair of classic black clogs. I doubt that classic black clogs would appear on many capsule wardrobe lists, especially since most people either hate clogs or adore them, but they are kind of a big deal on my list. Classic black clogs are so versatile. I love that I can just slip them on and wear them (in San Diego) with dresses in spring and summer and with socks in the fall and winter. I thought I had found the perfect pair. These from Hanna Andersson (by Maguba) had everything going for them: soft, comfy suede, an interesting heel shape, great heel height, and perfect price. (Originally $115, I got them during a one-day 40% off sale, plus I selected free shipping to my local HA store, so with tax they came out to $75.) Unfortunately, the sizes were all wrong. At first I ordered a size 38 based on the size chart. (I am a size 7, and the chart suggested size 38 for 7-7.5.) When they arrived, I tried them on and noticed they were a little big. They weren't loose in the toe box, but there was extra shoe hanging out after the back of my heel, if you know what I mean (basically the opposite of my heel hanging off the shoe). In every way the shoe was comfortable even after going out shopping to break them in, but the weird fit was kind of unsightly. Also, I worried that over time the leather would stretch and the shoe would be really too big for me. 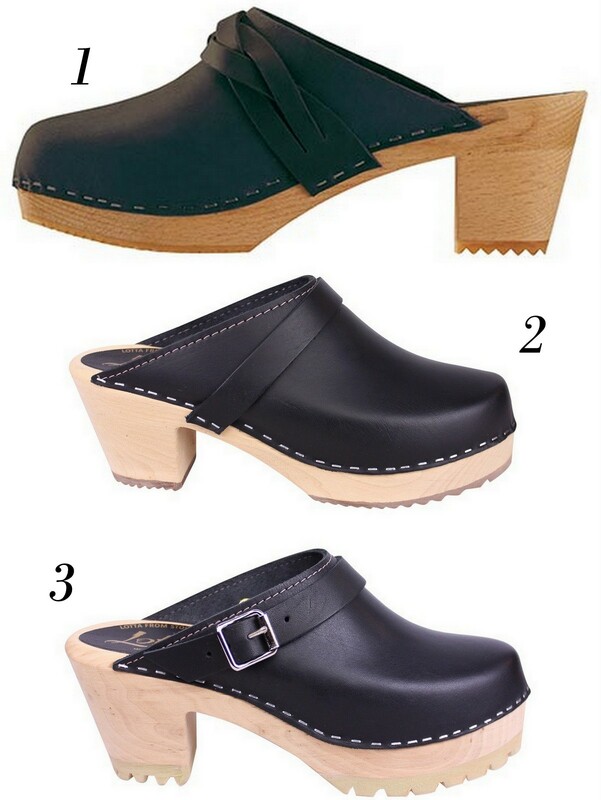 The ideal classic black clog would be these by Sven clogs because they are completely customizeable. I would get the base in a light stain and the upper in black nubuck, but the cost is just not in my budget right now. Not to worry because these three are some great alternatives, I just can't decide. Please help! Which ones should I get? By the way, I had briefly considered these and these as well, but decided against them because the heel is too low. I prefer 2.5" heels, and those are only 2". When it comes to clogs, there is a fine line between clunky & matronly and stylish & feminine, and that 1/2" makes all the difference. UPDATE: I chose #1, and they are perfect for me! I need a pair! I feel like they go with everrrrything. Right? but which ones to get? ?